Paternity means legal fatherhood. When a baby is born to married parents, the law automatically recognizes two legal parents, the husband and wife. Married couples do not need to take additional legal steps to establish paternity. When a baby is born to parents who are not married to each other, the law does NOT recognize the biological father as a legal parent. A biological father who is not married to the mother of their child does NOT have legal rights to his child until he becomes a legal parent. Paternity must be established first. Marriage – When a couple is legally married and the husband is the biological father, the father is automatically presumed to be the legal father. No additional steps are required to establish paternity for married couples. Court – Unmarried parents can get a court order naming the legal father. Either parent can do this through the OAG Child Support Division, by filing a suit in court, or by hiring a private attorney. It is required before asking the court to order custody, parenting time, or child support. There are two ways to get a court order establishing paternity: file an application for services with the OAG and go through a child support review process with child support staff. A court order can result in an agreed order or a paternity petition. If parents agree on paternity, they can ask for a DNA test and sign an agreed order. They may not have to appear in court if done this way through the OAG. If the parents do not agree, a paternity petition can be filed in court asking that an alleged father be named the legal father. The petition asks the court to decide on paternity. The courts can order DNA testing. When the alleged father does not believe he is the biological parent, the OAG’s Child Support Division will help by ordering a DNA test to determine whether he is or not. The DNA test is simple and accurate and will determine if the man tested is the biological father. The OAG also can assist a man who wants to be declared the legal father of the child and needs help establishing paternity. After paternity is established, conservatorship, child support, medical support, and a possession order can be established. These are the court orders that outline both parents’ rights and responsibilities toward their child. Video: What is a Parent? The Child & Family Research Institute offers a wealth of research materials about the importance of both parents. 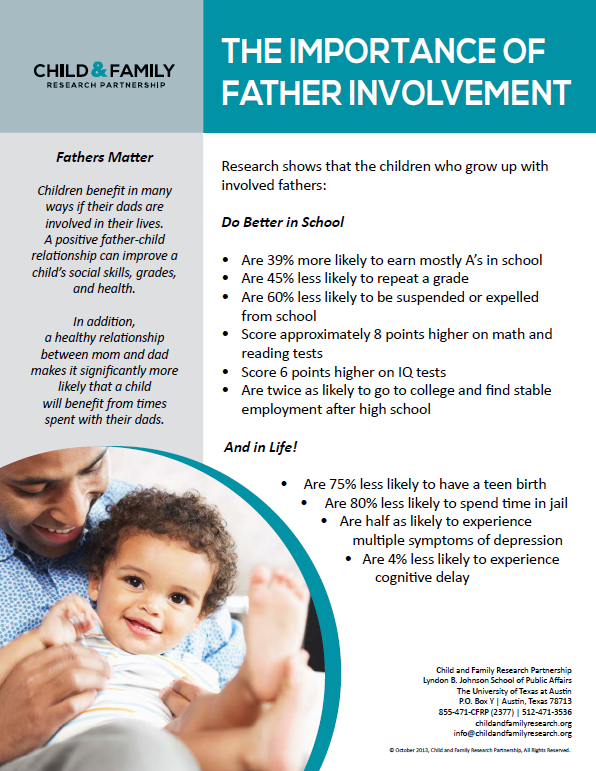 Visit for more on the importance of involved fathers. If the other parent is in the military, incarcerated, or living in a different city or state, OR if you need help with voluntarily establishing paternity, call the Paternity Opportunity Program (POP) at 1 (866)-255-2006.